These moonshiners are maraschino cherry red saturated beyond belief! 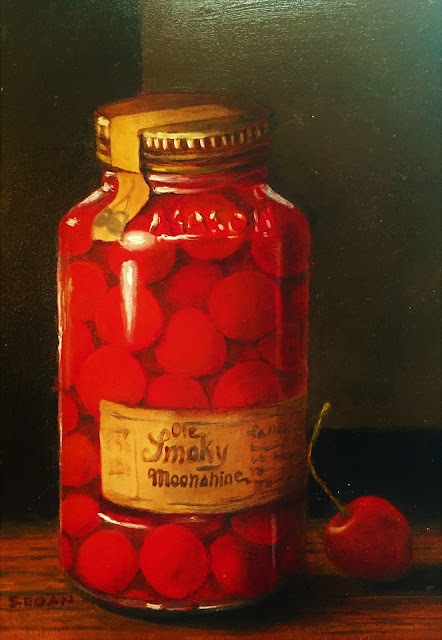 I began with a burnt sienna under painting and gave the jar a coat of red to work into. My husband suspects I only bought the jar to paint it. He is right! 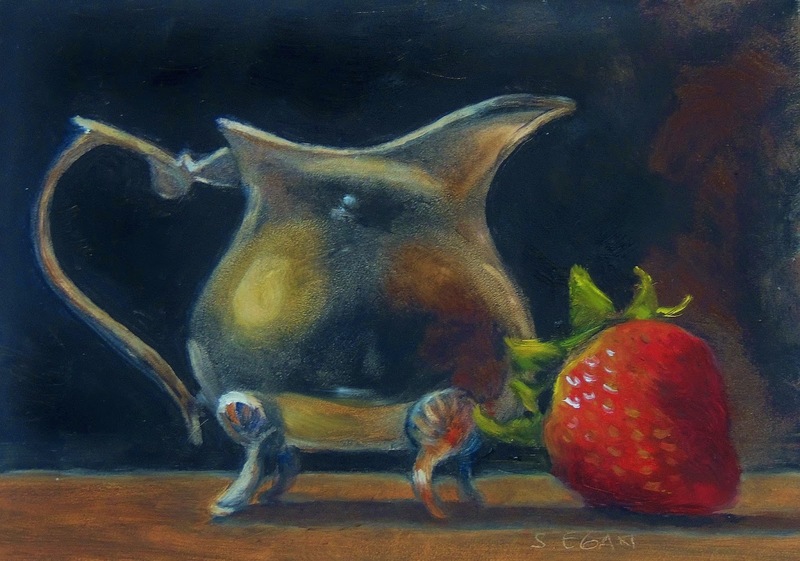 "Silver Pitcher with Strawberry", oil, 5 x 7"
My daughters and I filled this silver creamer with fresh cream, arranged a plate of strawberries, and drank tea from great, great aunt Martha Wozniak's Aberdeen china to watch the first two seasons of Downton Abbey. We left the series at the end of Season Two because we wanted Mary and Matthew, after that romantic whirl in the gently falling snow, to live happily ever after. And so they did. 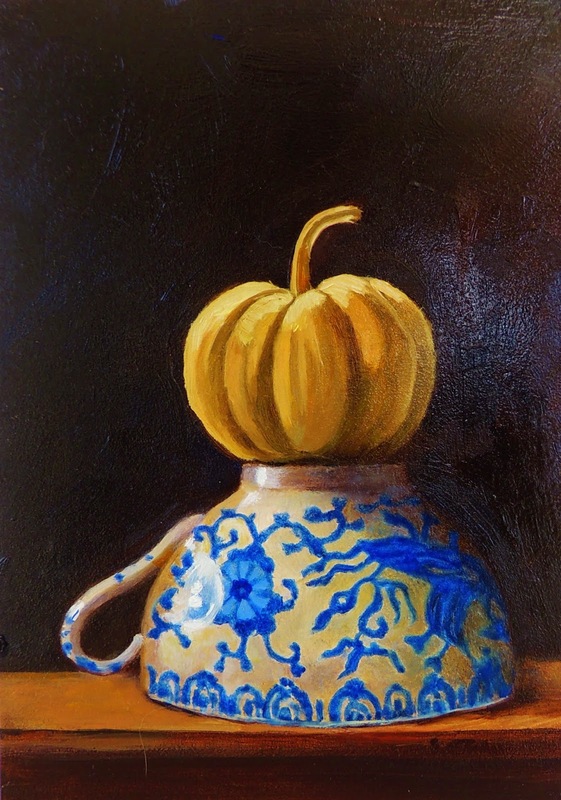 "Pumpkin Top", oil, 5 x 7"
This mini-white pumpkin is perched atop my favorite tea cup. My friend Gladys Mitchell has a teacup just like mine. Her brave teacup survived a house fire that damaged most of her belongings. 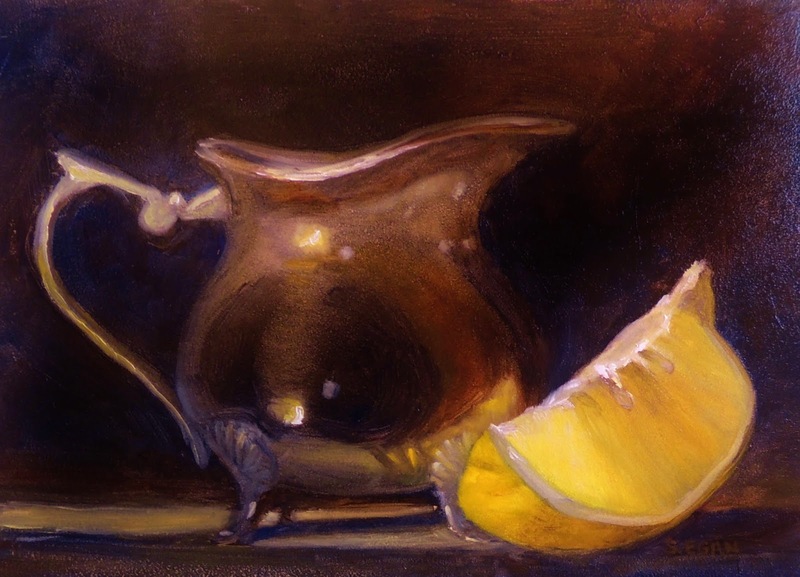 After the fire, her cup still sat prettily perched atop her fireplace in the midst of a shockingly soot covered room. 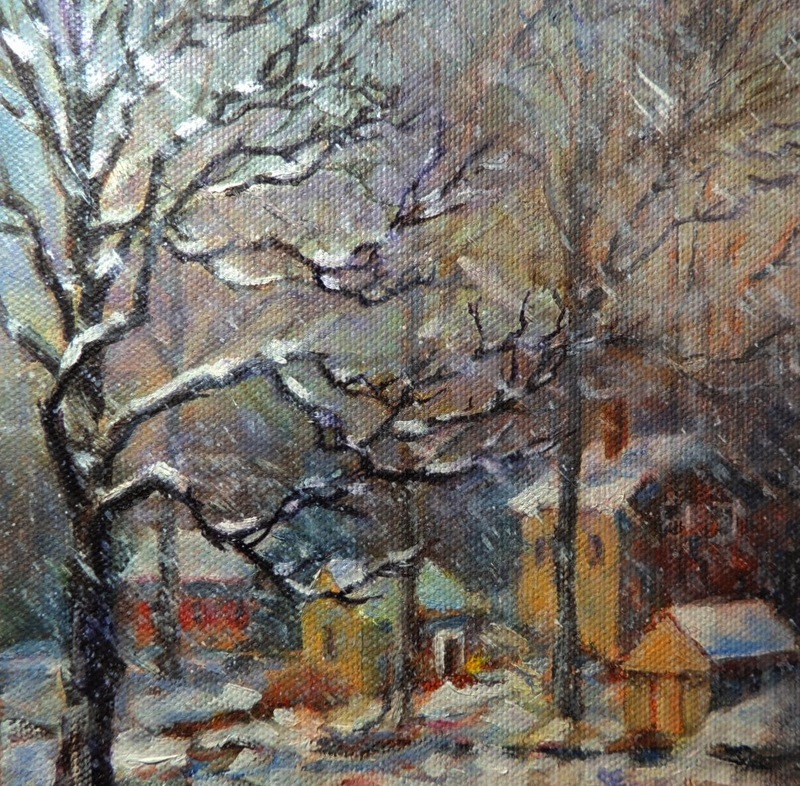 "Washington Crossing Village House", oil, 8 x 10"
of the tourist village in Washington Crossing Park on the Pennsylvania side of the Delaware River. In early November autumn's colors are still bright but brittle, crackle underfoot, wrap the house a halo of pale gold. I painted in the company of my Shetland Sheepdog and the Artsbridge River Rats. 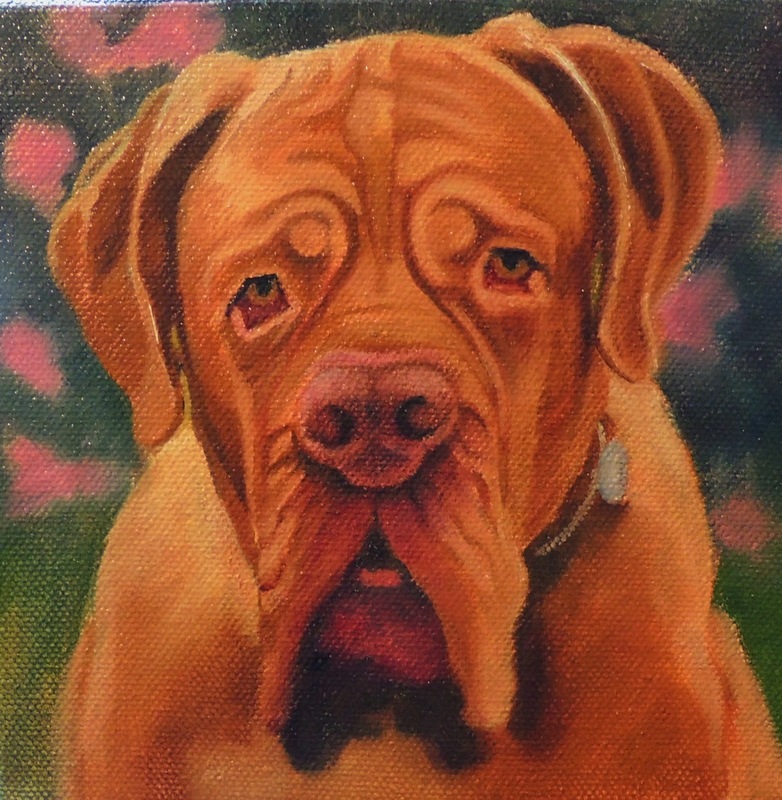 My daughter Arielle asked me to paint this portrait for her friend. Now Hercules' portrait watches over Danielle as she fights for her clients in the Philadelphia Public Defender's Office. A bricolage is a creation put together from items at hand. 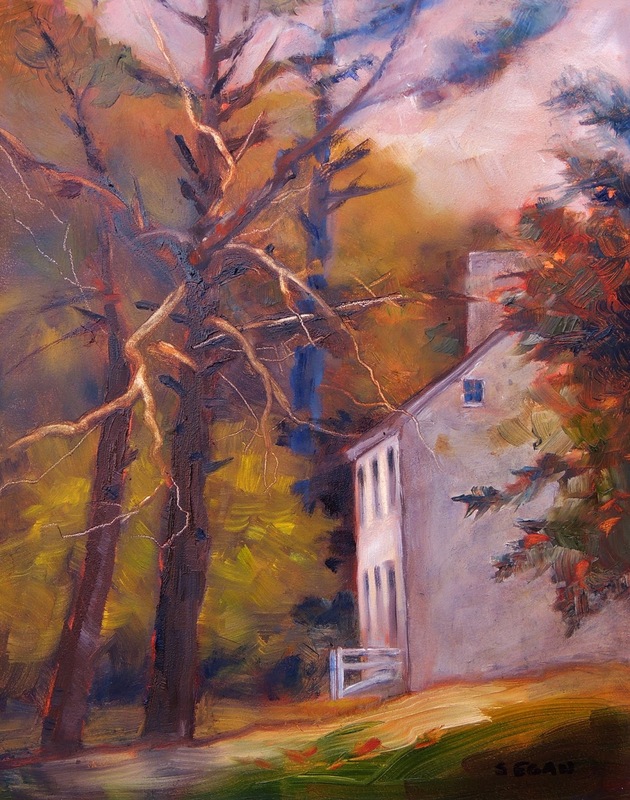 The term aptly describes the way these paintings were created. The birds are handsome and beautiful presences at my studio window feeder. 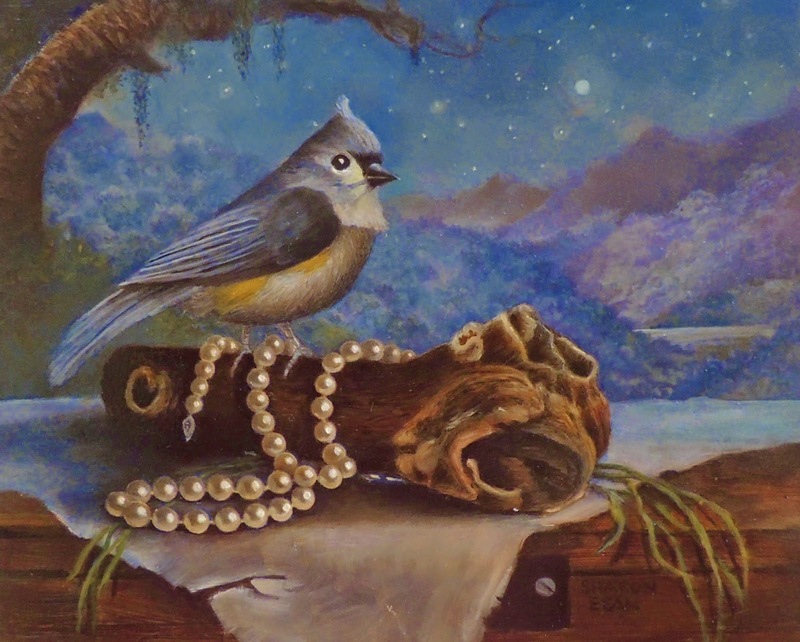 Fluttering outside, they top off the indoor collection of objects on my table: shells, my mother's pearls, flowers, driftwood gathered at the shore. Instead of my backyard, I imagine the birds deserve romantic backgrounds like the lush panoramas of the Hudson River School painters or the exotic jungles and waterfalls I photographed in Panama’s cloud forest last summer. This creamer is part of a set given to me by my dear friend Erin who loves treasure hunting. She has a genuine knack for unearthing the most enchanting and magical things. 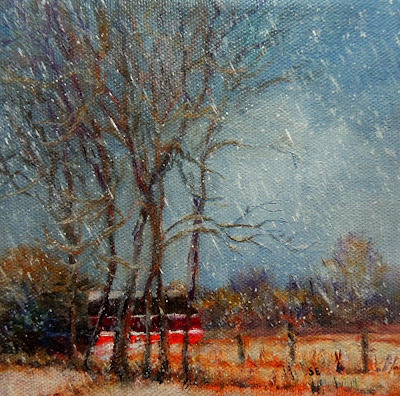 "Snowing Again", oil, 6 x 6"
"Sugan Road", oil, 6 x 6"
I painted "Sugan Road" in early December, 2013. 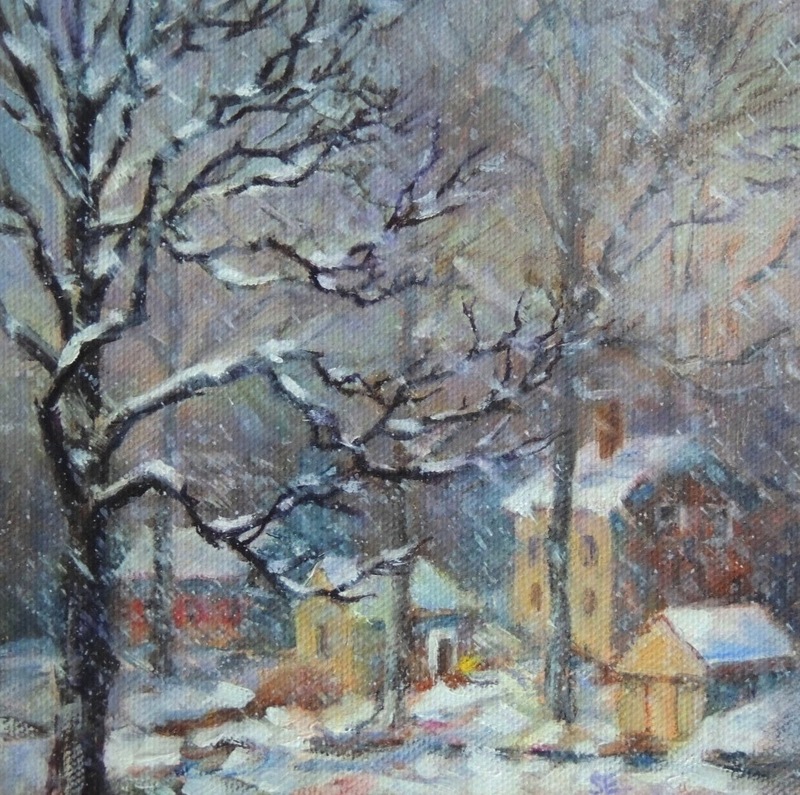 It is the first snow of the season, the soft beauty of white sugaring every home, every road, every tree. A few sweet December snows followed and then, we hoped, but there would be none to whiten Christmas Day. Now February, winter is brutal. Outside my window red emergency lights flare and pale. Heavy tree branches, ripped from their trunks by ice, die on the ground covered in snow white as hospital sheets. Mountains of black snow like Bolshevik tanks force pedestrians and traffic into single-file lines along streets. The polar vortex freezes anything in its maw. 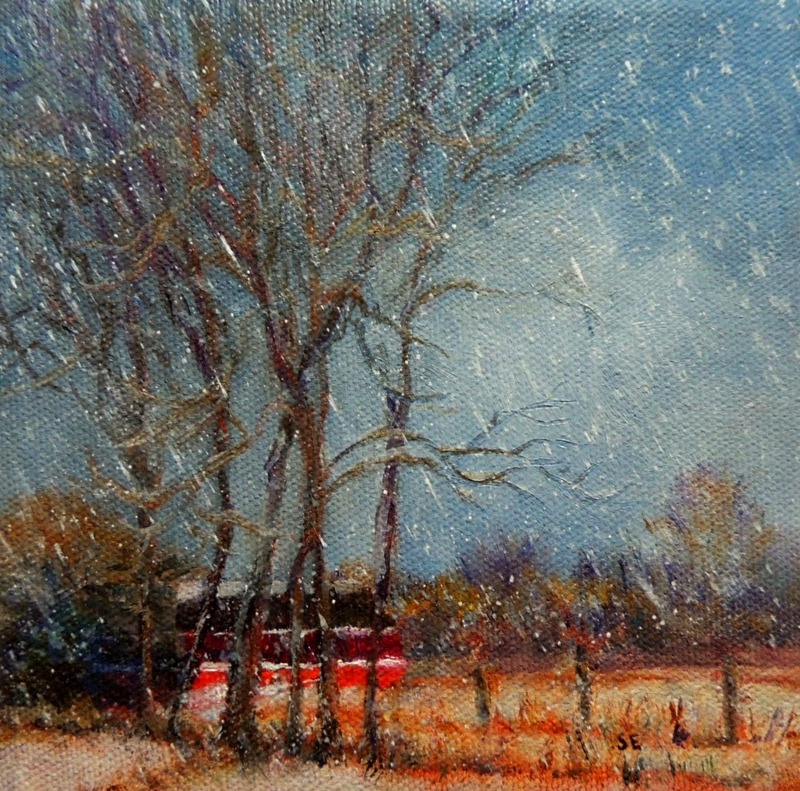 In "Snowing Again", a lone barn hides from winter as its red color reveals it. If not for paint, the landscape would barely have color at all. Still, in the brief illumination of the golden hour all colors warm, if only for minutes, before temperatures plunge for the night.